Your client is certain to be the winner with the new, mega-fun Lucky LogosTM Dice Game. It is fast paced, very simple to play and players try to roll "Logos" to win. Your client's logo will appear 9 times, 3 on each die. The game is designed for 3 or more players. Each game is provided with instructions, 3 dice, and 30 chips inside a clear case. Made in the USA. Price includes a One Standard Color imprint in 9 locations on Dice. Additional Imprint Color: Add Set-Up: $30 (G) per Color, or $35 (G) if PMS Color, Plus $1.60 (G) per Game, running charges. Packaging: Clear Plastic Case. Individual Polybags. Chip Colors Available: Red, Blue, Green, White, or Yellow. Other colors available at 250 games or more. Note: Yellow is the standard chip color and will be supplied if not specified. To Play: Each player gets 3 chips. (Alternately, Coins can be used.) Place a tray in the center of the table to serve as a "Bank" to collect chips. Each player, in turn, rolls 3 dice at the same time. 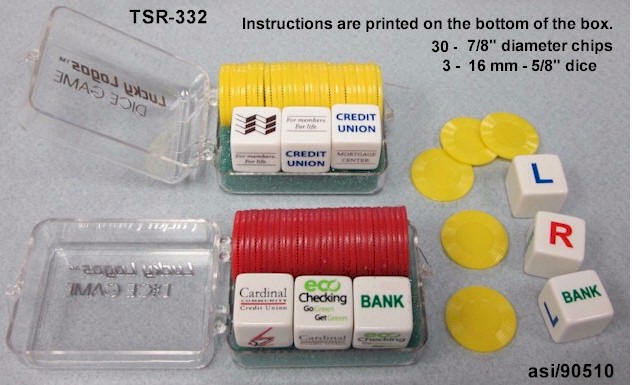 For each "L", "R" or "Bank" rolled, pass a chip to the player on "Left", " Right", or to the " Bank". For each "LOGO" rolled, player keeps the chip. When player has only 1 or 2 chips, roll only that many dice. No chips, no dice are rolled. The last player with chips, need not roll and wins the "Bank".